Britain’s first underwater submarine dive trail has opened off the South Coast. Britain’s first underwater submarine dive trail is the protected wreck of HMS/mA1 – the first British-designed and built submarine used by the Royal Navy which sank in 1911 in only 39 feet (12 metres) of water in the Solent. It's located about 2 nautical miles from the entrance to Chichester Harbour. Launched by English Heritage and the Nautical Archaeology Society, the HMS/mA1 submarine dive trial is the fourth underwater tourist trail for protected wrecks to open since 2009 and is part of an English Heritage project to create up to a dozen trails by 2018 for historic wreck sites dating from the 17th to the mid-20th centuries. The trails that are already running are three sunken wooden warships and have attracted hundreds of licensed divers. They are: HMS Colossus, a 74-gun warship built in 1787 which sank off the Isles of Scilly in 1798; the Coronation built in 1685 and lost off the coast of Plymouth in 1691; and the ‘Norman’s Bay Wreck’, possibly a Dutch ship which sank during the Battle of Beachy Head in 1690 near Bexhill on Sea in Sussex. 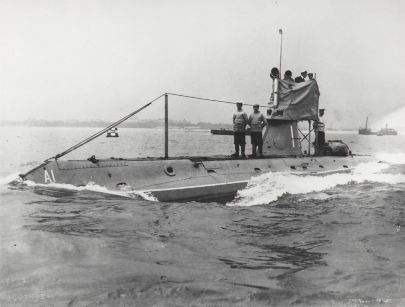 Built in July 1902 by Vickers Sons & Maxim Ltd, the HMS/mA1 submarine was actually sunk twice, first in 1904 and again in 1911 while unmanned and being used for underwater target practice using an automatic pilot. It was designated in 1998 under the Protection of Wrecks Act (1973). Licensed divers on the new trail will be able to see a complete submarine resting upright on the seabed with the bow clearly visible. Divers will be given an underwater guide to help them navigate the wreck and recognise key features such as the conning tower, torpedo loading hatch, and the stern towing and lifting cable. Divers wishing to dive the trail must be licensed to access it. Access is being managed by the Nautical Archaeology Society and the wreck’s licensee, Martin Davies. Licenses are issued by English Heritage. A fifth dive trail is due to open in June for the paddle steamer Iona II which sank off Lundy Island en route to the Bahamas in February 1864.